Comparison of drone image clarity (within property boundary) with low resolution satellite image (outside propert boundary). Recently I went down to see Linda and John Stanley of Chestnut Brae, an 80 acre chestnut farm in Nannup, south western Australia. I wanted to demonstrate to them how good quality drone imagery, along with an online service such as Drone Deploy could be used as the base of an effective farm management and planning tool. Running a drone mission at Chestnut Brae to create a farm planning map. Some basic needs of farm planning and management are being able to determine distances, areas and volumes or different aspects of the property. Traditionally this would mainly be done by going out into the field and physically measuring it or perhaps by using low resolution satellite imagery printed onto an A1 laminated poster of the farm. 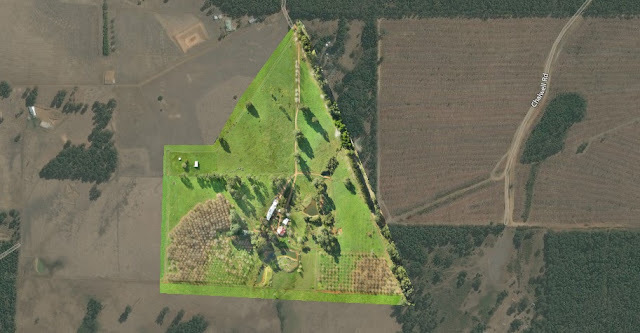 However its now possible, using low altitude drone imagery coupled with an online user interface, for farmers such as John and Linda to use a tablet or laptop to very easily to zoom in and out of a high resolution map of their property. Zoom levels are far greater than satellite imagery which make using the distance measure, area and volume calculating tools plus much more very accurate, this helps to take the guess work out of farm management ..... all from the comfort of their living room. Using the distance tool it's simple to measure the length of the east boundary to get easy estimate of materials for an accurate quote on building a new fence. A mobile electric fence is used for penning the sheep, each fence segment is 50m long, why not quickly measure the perimeter of the proposed next location before moving it? This helps take the guesswork out - see length measured in sidebar. Measuring the total area of the east orchard - see details in sidebar. Also trees can be counted and health assessed. Why not segment the east orchard into two to get a more accurate area of the older trees vs the younger chestnut trees? Dropping an elevation marker on a proposed location for a windmill lets us easily determine the head height to the tank at the top of the farm - The tank has an elevation of 245m, see the windmill location elevation in the sidebar. 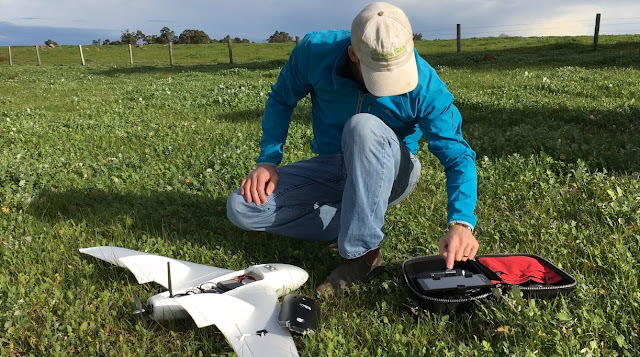 The high resolution of the drone map means that zooming in to calculate areas of paddocks is far more accurate than satellite. The volume tool helps with calculating both cut and fill volumes - see the values listed in the sidebar. Overall farm plan showing distances, areas, volumes, elevation markers all created from drone imagery and Drone Deploy. It's not always easy to understand the different elevations on a property, the Drone Deploy 'elevation' tool makes it clearer using a colour gradient. The values shown in the colour gradient can be adjusted using the histogram to get a better view of the elevations. This kind of tool enables a land owner to better place assets such as header tanks, drainage trenching and dams, plus with the addition of contours gives the accuracy needed for regenerative agricultural techniques such as keylining. Using the 'elevation' tool is a great way to easily visualise the rise and falls on the farm. The plant health tool is great for a basic visualisation of plant health on the map and can be used to determine when and where to move stock around the farm. This tool, when used with RGB images (normal photos) uses what's called a VARI index, it is a measure of "how green" an image is. For more accurate data on plant health an NIR camera can be used when flying the drone, this will provide more meaningful data when the NDVI index is applied. The plant health tool shows areas of paddocks with fuller growth of grass and pasture. Whilst not necessarily a tool for farm planning, as part of the process of generating drone imagery often a 3D view is produced. Because the imagery is based on a top-down view trees aren't usually modelled very well, they look 'ghostly' like a weeping willow. But even with this shortcoming a 3D view can still have its uses. A 3D view of the chestnut farm generated from drone imagery. Drone imagery is opening up new possibilities for farm management, with its high resolution, high relative accuracy and low cost compared to traditional aerial imagery, farmers now have access to a very powerful tool that can increase efficiencies on the land. Pre-flight checks before a drone mapping mission.